Reuben is using Smore newsletters to spread the word online. Netflix is a streaming service where people can watch a variety of shows and movies. There are plenty of generic genres like, dramas, comedies, etc. There are also more unique genres like stand-up comedy acts, etc. 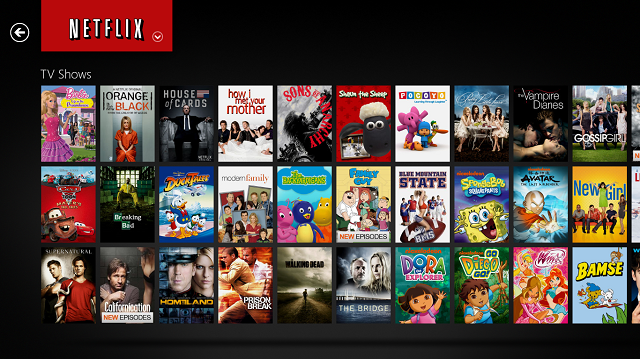 Netflix is an online service and can therefore be used with a tablet, laptop, game console, etc. There are plans ranging from $7.99-$11.99 per month which can be cancelled online anytime. Netflix offers a variety of movies and shows to entertain or educate oneself. On the home page of Netflix's website, it says "Drama, Comedies, TV Shows, Documentaries -- all the stuff you love to watch, personalized for you"(https://www.netflix.com/ca/). It is personalized because Netflix keeps track of one's watch history and provides suggestions of what to watch next. There is also a kids section within Netflix with movies and shows that are appropriate for a younger age. Netflix is a leader in original content as well as content in general. There isn't a definitive slogan for Netflix. "Watch Anywhere. Cancel Anytime" is the current slogan that can be found on Netflix's website (https://www.netflix.com/ca/). "Watch TV shows online, watch movies online" is another slogan used by the company. 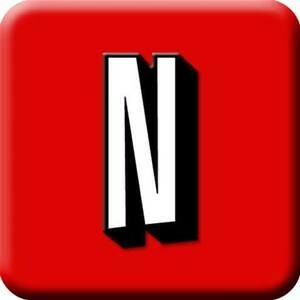 The logo/ symbol of Netflix is "Netflix" in thick, red font, which is often abbreviated with a thick, red "N". The logo/symbol is also often in thick, white font but with a red background. The target market from a demographic standpoint for Netflix appears to be people under the age of 40 who can afford to spend $8 a month. To be more specific, its target market is younger families, hence the kids section. Also, Netflix makes it easy to make separate accounts within one account, which is useful for family members who like different shows. Another thing that proves Netflix's aim at younger families is the photos of young families on its website (https://www.netflix.com/ca/). Geographics are not really relevant when it comes to the target market because as of 2016, Netflix is available worldwide. From a behavioural standpoint, people who use Netflix tend to enjoy pausing and rewinding easily, and binge watching shows rather than tuning into one episode per week. The only psycho-graphic factor is the fact that the target market enjoys watching TV shows and movies; specific taste in shows or movies does not matter as Netflix has been the leader for digital content since 1997 (https://media.netflix.com/en/about-netflix). Netflix has three promotions. The basic plan is $7.99 per month. The standard plan is $9.99 per month. The premium plan is $11.99 per month. There are certain features one can get with a more expensive plan. For example, Netflix can be used on 4 different devices at once with the premium plan. More details can be found on the website (https://www.netflix.com/ca/). 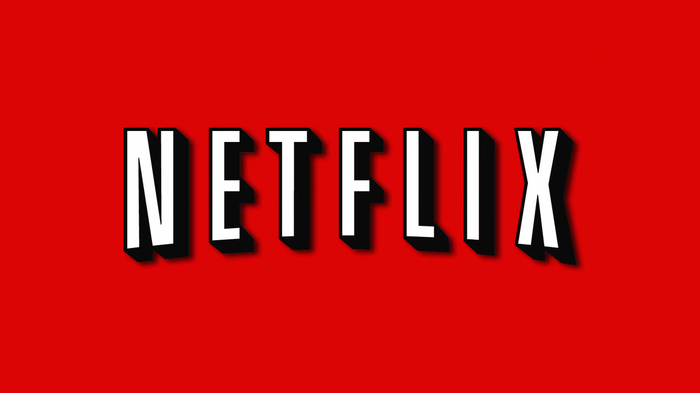 In order to promote its service, Netflix offers the first month of use for free. Netflix's main form of endorsements are trends on social media. For example, "Netflix and Chill" is a common comedic phrase/date idea used mainly by teenagers. Famous people talking about Netflix in the media is also a big endorsement for the streaming service. For example, on February 13th, 2014, Barack Obama tweeted about a Netflix original series: "Tomorrow: @HouseOfCards. No Spoilers, please"(https://twitter.com/BarackObama/status/434108103789793281?ref_src=twsrc%5Etfw). The company also has commercials and other advertisements; an example is shown at the bottom of this section. Netflix's main sponsorships are with the content they own, especially their original. series. 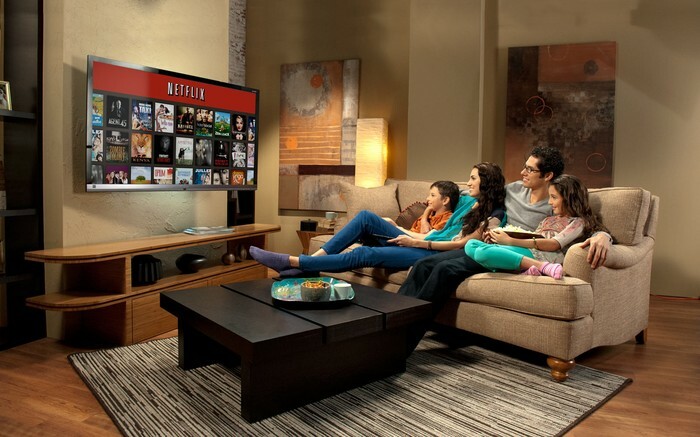 Every program streamed via Netflix is affiliated with Netflix and has a sponsorship with Netflix; Netflix sponsors all shows that it streams because it pays for the rights for the shows. Examples of original series on Netflix are House of Cards, Orange is the New Black, and Daredevil. Also, any deal in which Netflix pays a person, team, organization, etc. to promote Netflix is considered a sponsorship. It is believed by many that Netflix is the most successful streaming service in America, but there are still other services that are not far behind. Major competitors of Netflix, specifically in the United States, are Amazon, Hulu Plus, and HBO. Netflix holds about a 36% market share in the U.S, Amazon 13%, and Hulu Plus 6.5% (http://www.investopedia.com/articles/markets/051215/who-are-netflixs-main-competitors-nflx.asp). According to Reed Hastings, CEO of Netflix, HBO is his company's "biggest, long-term competitor for content" (http://www.forbes.com/sites/avaseave/2013/06/06/netflix-to-competitors-be-afraid-be-very-afraid/#7b2f34ac8a27) . Although Netflix is clearly the dominant streaming service, there are others that are prevalent and successful. In 2012, Hastings talked about successful movie output negotiations HBO had with Universal and Fox (Seave, 2013). Retrieving quality is a struggle, as Netflix spent 2 million per episode on The Blacklist, and 1.35 million per episode on The Walking Dead (Moskowitz, 2016). Netflix is clearly in first place among streaming services; however, it is very expensive to purchase certain content. If Netflix happens to fall into a financial crisis, there are other services that would be able to take advantage. Important brand attributes that Netflix portrays is its low price, original shows and movies, and its popular unoriginal shows. Customer ratings of Netflix's competition would be either the same content for more or less content for the same. On the contrary, Netflix's customers ratings of Netflix would either be 'more for less' or 'the same for less'. Its originals are a key aspect of their positioning as, "differentiation is the name of the game when it comes to streaming success" (http://www.pcmag.com/article2/0,2817,2489103,00.asp). However, Netflix's positioning is still head-to-head because the streaming business is a direct comparison between and competition for three things: original content, outside content, and reasonable pricing. The value proposition for Netflix is aimed to be "more for less", but it is also "the same for less" depending on what streaming service it is being compared to. Its cheap $7.99 per month price, now increasing to $9.99 for new members (http://www.pcmag.com/article2/0,2817,2489103,00.asp), is promoted by Netflix alongside its immense outside and original content. Netflix is trying to gain a competitive advantage by using a variety of differentiation techniques. For example, their possession of immense outside and original content is an example of product differentiation. Their easy to browse, ad-free service is an example of service differentiation. Their vibrant, red company colours are an example of image differentiation. An error in Netlfix's positioning is the upcoming increase in price for new members. In previous years, Netflix constantly advertised their $8 per month price. Now that the price will increase, people who associated Netflix with $8 will be surprised and possibly disappointed. This increase in price will also affect the "more for less" value proposition. Another error in their positioning is the lack of an established, effective slogan. As stated earlier, there are a couple basic slogans on the website, but nothing that most people directly associate with the company. One axis on the map is price, the other is quality. It is important to note that "quality" is primarily based on amount of outside and original content. 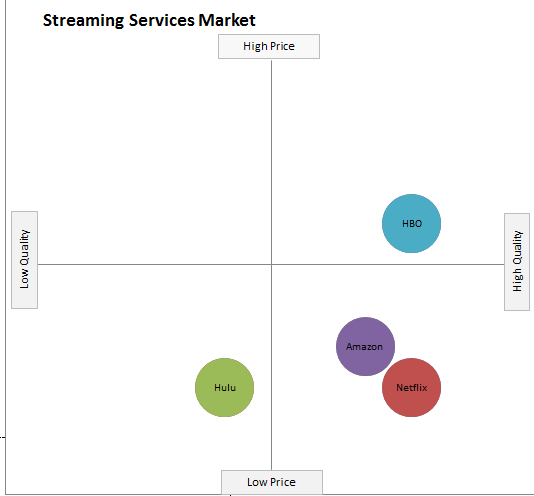 The streaming services being compared on the map are Netflix, HBO, Hulu, and Amazon. The reason I placed HBO the same quality as Netflix is because its $14.99 price causes it to be perceived as higher quality. However, people know Netflix for its $7.99 per month price. Although Hulu is the same price as Netflix, it is lower on the quality scale because it is known to have ads and not as much content. Amazon is slightly higher priced than standard Netflix ($8.99 per month), and is is slightly lower on the quality scale. Although Amazon isn't as known for its immense content, it has 40 000 titles to stream and enabled offline downloads for content that is not included in its instant video feature (http://www.pcmag.com/article2/0,2817,2489103,00.asp). However, most people may not realize this and perceive Amazon as lower quality because it is not as well known as Netflix.